Just like his town rugby counterpart, Hawick Royal Albert gaffer Paul McGovern is demanding a major response from his players after a humiliating performance last weekend. A home tie tomorrow (Saturday) in the King Cup against Sauchie will at least give the side a break from a demanding Lowland League campaign. 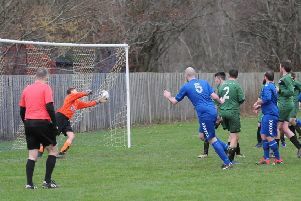 But the side will be anxious to make reparation regardless after Saturday’s 6-0 thumping at Coldstream. All the hosts’ goals came in the first half, attributed to “schoolboy” and “horror” defending, while both sides also missed a penalty. 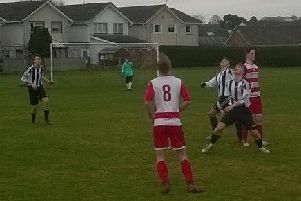 Although the Royalists never looked like scoring, they rallied in the second half and commendably stopped Coldstream from finding the net again. But McGovern, who indicated there would be changes in the line-up, said the story of the game was in the first half. “At half time, the game was over – no way would we turn round a six-goal deficit,” he said. “But what I was looking for was to restore a bit of pride in their performance and, to be fair, I got that. “Coldstream thoroughly deserved their victory but I have to look more at what my players gave me, particularly in first 45 – they never performed and lost goals which could have been prevented.